Welcome Winter [H7099] - $14.00 : Yarn Tree, Your wholesale source for cross stitch supplies. Cross stitch pattern by Twin Peak Primitives. Welcome to winter, where there is a cold bite in the air, snow is falling & friends are ice skating & sledding. Two barns sit in the background with snow covered roofs. Friends are outside enjoying the snow & ice by ice skating & sledding. Even the puppy dogs are enjoying the snow! 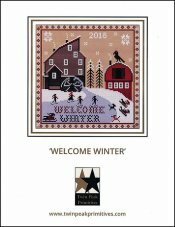 "Welcome Winter," is stitched underneath the ice skaters. This is snow much fun! Stitch count is 105W x 106H. Stitched on #5357 Zweigart Oatmeal Rustico Aida 14ct.